Police secure the entrance to the High Court in Durban South Africa, April 6, 2018. 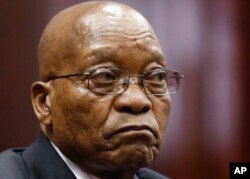 Former South African President Jacob Zuma appeared in court Friday to face corruption charges. The appearance was brief but significant, coming just under two months after his resignation. 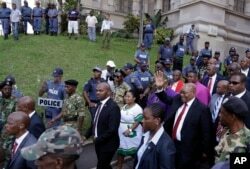 Addressing supporters outside the courthouse Friday, Zuma criticized the charges as politically motivated. "Innocent until proven otherwise," he said after appearing at the Durban High Court to face charges of fraud, racketeering, corruption and money laundering. Earlier, a defiant Zuma smiled and waved to hundreds of supporters as he entered the building. In court, the prosecution told Judge Themba Sishi that they have agreed with the defense to postpone the case until June 8. Former South African President Jacob Zuma in the dock at the High Court in Durban, South Africa, April 6, 2018. The postponement was mainly to give Zuma a chance to finalize his review application, objecting to the decision to re-charge him. Zuma was not asked to plead or pay bail. The judge only warned him to appear on the next court date. Former South African President Jacob Zuma waves to supporters as he leaves the High Court in Durban, South Africa, April 6, 2018. Andile Mgxitama, one of the Zuma supporters who prayed, sang and danced outside the court, said "we are here to stand with the president of the people." "We will stand with President Zuma now," he said, "and we will stand with him until the land returns. Hands off Zuma." For many South Africans, seeing the former president in the dock was surreal. And for Sizakele Dhlamini, it is a positive development in African democracy. "It is a norm in African countries that former presidents or current presidents who break the law, they are left to go scot-free," said Dhlamini. "South Africa has proven beyond reasonable doubt that it's doable. It can be done." Protesters in support of former president Jacob Zuma protest outside the High Court in Durban, South Africa, April 6, 2018. 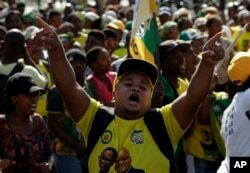 Zuma's party, the African National Congress, has decided not to support him during his court battle, even though some ANC members came out to support him Friday, saying they were doing so on their own. Political analyst Karima Brown said this could be a big blow for Zuma. "This is a man deeply at odds with his own organization," she said. "For someone like Jacob Zuma, who has been in the African National Congress for more than sixty-five years, that is a deep, deep wound." The charges relate to kickbacks Zuma allegedly received in connection to a European arms deal undertaken by South Africa in the 1990s. A representative for French arms dealer Thales SA is facing charges similar to Zuma's. Zuma first appeared in court for the same charges in 2007. They were dropped in 2009, but the Democratic Alliance party convinced the court to reinstate them, leading to Friday's appearance. As usual, Zuma's supporters demanded that he sing his trademark songs Friday — and he did not disappoint. This story was written by Thuso Khumalo in Johannesburg for VOA News.